Subrata Deb Nath is a Ph.D research assistantâ€“additive manufacturing, University of Louisville, Louisville, KY; Akul Rajan is a student at William Mason High School, Mason, OH; Joyce Yeung is director of marketing, Concept Laser, Inc., Grapevine, TX; Sundar Atre holds an endowed chair of manufacturing and materials, University of Louisville. Fig. 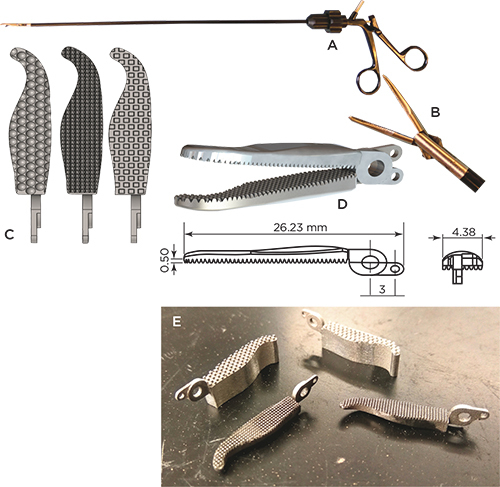 1—A) laparoscopic instrument and B) its grasper C) CAD model of customized surgical graspers with three different patterns D) grasper assembly and dimensions E) L-PBF printed surgical graspers. The rising rate of laparoscopic bariatric procedures (see sidebar) brings with it a need for customizable tools to ensure better patient outcomes. Because same-shape, same-size tools are used on patients of various shapes and sizes, complications occur. A University of Louisville 3D Printing Business Incubator team, consisting of Alex Conradi, Josh Graff, Jacob Groeschen and Ryan Stoller with the supervision of Dr. Michael H Bahr from the University of Louisvlle Medical School, recognized this reality as an opportunity for additive manufacturing. So the team developed novel laparoscopic graspers made through 3D printing using laser-powder bed fusion (L-PBF). The instruments can be customized according to tissue types and pressure points. Other benefits include teeth that minimize slippage, high dimensional accuracy, reduced lead time and a composition of stainless steel requiring less energy for manufacturing. The team L-PBF printed surgical graspers using 17-4 PH steel as part of a collaboration with Concept Laser, Inc., Grapevine, TX. The following shows the steps taken to ensure dimensional accuracy and density, and for verifying that these instruments can be printed accurately and precisely, with little deviation, from drawings made using SolidWorks CAD products by Dassault Systèmes, Waltham, MA. Fig. 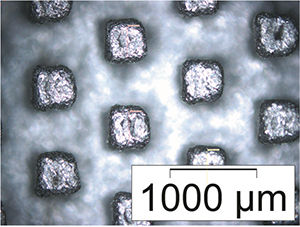 2—Optical images of the cross-section of surgical graspers show that printed samples are near full density. The laparoscopic graspers were designed and simulated with three teeth patterns—lofted, cubic and hemispherical (Fig. 1c)—for gripping tissue, blood vessels and fat during surgery. The CAD assembly design is shown in Fig. 1d. The grasper measures 26.23 mm long and 4.38 mm wide, and the microscopic teeth vary from 250 to 1000 µm. The grasper design facilitates multi-planer gripping to reduce stress on the tissue. It also provides chamfered grip yielding, meaning that after a certain force is reached, no additional force will be applied. Fig. 3—Representative optical image of the surgical grasper. Concept Laser printed 54 surgical graspers using the same processing parameters. All were found to be near full density, with no significant difference observed in relative density, irrespective of micro features (Fig. 2 and Table 1). The cut and polished surfaces exhibited few pores, and those measured only a few microns at the most. 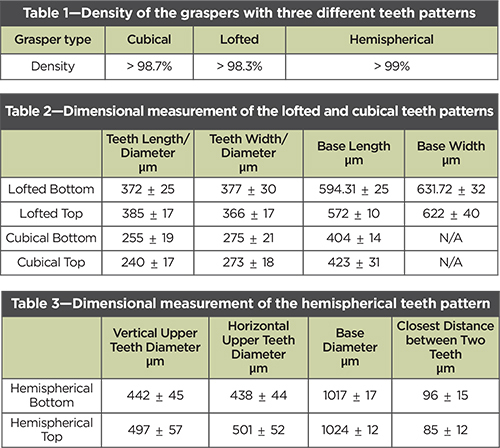 The team measured dimensions for the lofted, cubical and hemispherical grippers, and also collected data for the teeth length, teeth width, base length, base width, vertical teeth diameter, horizontal teeth diameter, base diameter and the closest distance between two teeth of each appropriate laparoscopic gripper sample. Table 2 shows the average measurements for the lofted and cubical grip types. Table 3 shows the average measurements with standard deviation for the hemispherical grip type. Lofted-teeth pattern. There was no observable difference between the average base length and base width, and the actual measurements of the base length and width were not observably different from the experimental averages. Secondly, the average length and width of the lofted gripper type had no observable difference between them. Conversely, the actual measurements of the teeth length and width were observably different from the experimental averages. This indicates a probable error with the 3D printing of the lofted gripper types on both the top and bottom sides. Cubical-teeth pattern. Concentrating on the base length (not enough data were obtained for the base width), the experimental results were not observably different from the intended results. Similarly, both the teeth length and width diameters were deemed accurate. The only significant observation found on the cubical gripper types involved slight teeth deformation on the edges of some samples. This deformation is unlikely to affect the gripper’s functional capacity. Fig. 4—Scanning electron microscopic images of teeth patterns of the graspers. Hemispherical-teeth pattern. The actual measurements of the upper teeth were not observably different from the intended measurement. The same held true for all other measurement comparisons related to the hemispherical-teeth pattern. Laparoscopic (minimally invasive) procedures for treating obesity are on the rise, creating an opportunity for 3D metal printing. According to iData Research, the market for laparoscopic bariatric surgical instruments is expected to increase from $7.61 billion in 2016 to $11.68 billion by 2021, for a compound annual growth rate of 8.9 percent, a direct result of the nation’s obesity rate. Sixty-eight percent of Americans are categorized by doctors as overweight, with a body mass index (BMI) between 25.0 and 29.9; 34 percent of this group are obese, with a BMI of 30 or higher. While surgery can be an effective treatment for obesity, the instruments sometimes fall short. Currently, same-size, same-shape tools are used for all laparoscopic procedures, though patients are anything but that. This lack of customized tools contributes to thousands of surgical complications monthly, thus creating an urgent need for the development and commercialization of customizable tools. While conventional manufacturing processes such as forging and metal-injection molding offer little opportunity for patient-specific customization, 3D metal printing could prove to be the cure. Bulk density plays a major role in achieving competitive mechanical properties for L-PBF-printed parts. All the graspers were printed with very high density, which demonstrates the reliability of the process. Overall, analysis of the measurements show that the hemispherical and cubical-shaped samples were accurately printed, though the lofted samples were inconsistent and require further study.